Alexandria Ocasio-Cortez is fun. No, I mean that in all sincerity; she’s a fun candidate. She’s now one of the faces of the emerging left wing of the Democratic Party. Some have even called her the future of the Democratic Party. Maybe they should slow their roll on her, but hey—a Democratic implosion of rising talent is always a fun show to watch. She’s feisty. She has her moments, but when it comes to the policy discussion for her television hits, she veers into rocky shoals. Ocasio-Cortez is clueless on the Israeli-Palestinian conflict, playing whack-a-mole concerning whether there should be a two-state solution. Don’t expect anything rational from here on out. Three days after her interview on PBS’ Firing Line, in which she voiced her support for a two-state solution, she moved away from that position. She recently attended a conference with anti-Israel activist Linda Sarsour, so that’s all you need to know where she’ll probably land. The far left is viciously anti-Israel. You have to be in order to call yourself a proud left-winger. CNN’s Chris Cuomo had her on his show, where she proved once again that she has no clue what she's talking about concerning economic policy. Ocasio-Corez thinks the military got a $700 billion increase, wrote a $2 trillion check for the Trump tax cuts, and the Medicare for All initiative isn’t bad because it would reduce the costs of funerals. Yeah, no one will die under a single payer system. Hey, not dying—sounds great on paper. Concerning application, you’d have to be on crack cocaine to think this would ever be cost-effective. It’s not. It has a $30+ trillion price tag. The three-decade price tag for the Left’s goodie bag—free college, Medicare for all, etc.—lands in the neighborhood of…$218 trillion. It’s a pipe dream. The Washington Free Beacon made the good point that even in Bernie Sanders' home state, Vermont, they ditched a single-payer system because it was too expensive. Even deep-blue California hasn't passed single-payer due to similar budgetary constraints. Alexandria Ocasio-Cortez defended her push for a "Medicare for all" health care system on Wednesday in part by citing the reduced cost of funeral expenses it would bring about. CNN host Chris Cuomo brought up the "sticker shock" of a single-payer system to his guest, noting such a proposal didn't even work in a blue state like Vermont. 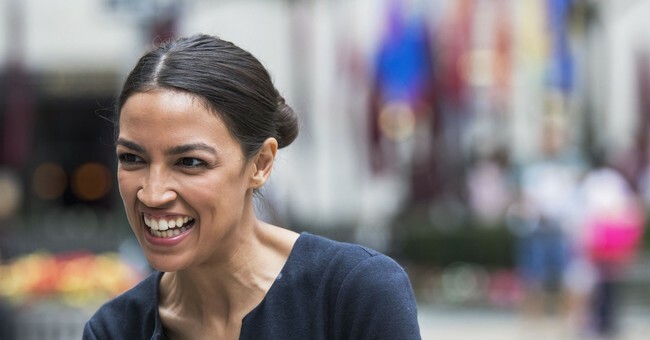 Ocasio-Cortez, who burst onto the national scene when she upset Rep. Joe Crowley (D., N.Y.) in the Democratic primary in June, deflected by saying the current system causes sticker shock. "We’re paying for this system," she said. "Americans have the sticker shock of health care as it is, and what we’re also not talking about is why aren’t we incorporating the cost of all the funeral expenses of those who died because they can’t afford access to health care? That is part of the cost of our system." Ocasio-Cortez has made equally inane remarks about the unemployment rate, which she tried to downplay by saying its low rate is due to Americans working two jobs and putting in more hours; both are totally unconnected to how the rate is calculated. And fact checkers had a field day picking her talking point to pieces. Blahous added that even doubling taxes, which is a political suicide, couldn’t pay for the Ocasio-Cortez-Bernie Sanders health care initiative. Oh, and as for socialized medicine, it’s really not working. Frankly, I don’t care what the rest of the world does. Only America-hating left-wingers have that mindset. As for the Trump tax cuts, it’s allowed three million working class families to receive bonuses, driven unemployment to an 18-year low, boost economic growth to four percent in the second quarter, set record highs in consumer and small business confidence, and boosted wages for U.S. workers to their highest levels in a decade. Yeah, the Trump agenda is really bad…if you’re a blind, deaf, and dumb liberal Democrat. For us normal people, the economy is booming.